I wish my editor could insert sound bites in this review so that I could provide you with auditory tidbits to sample, but my words and photos will have to suffice. 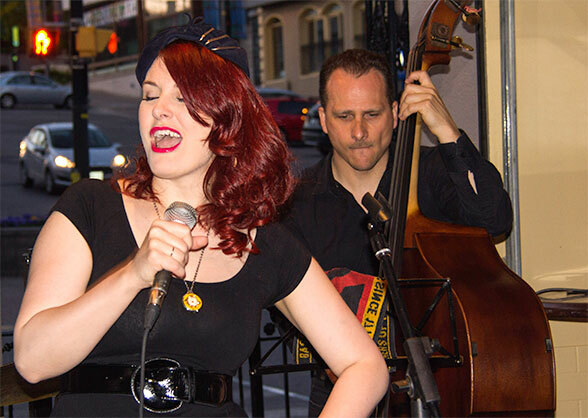 You simply must mark your calendars for the winter version to tempt you and hold you over until next summer, as the Barrie Jazz and Blues festivals are not to be missed. 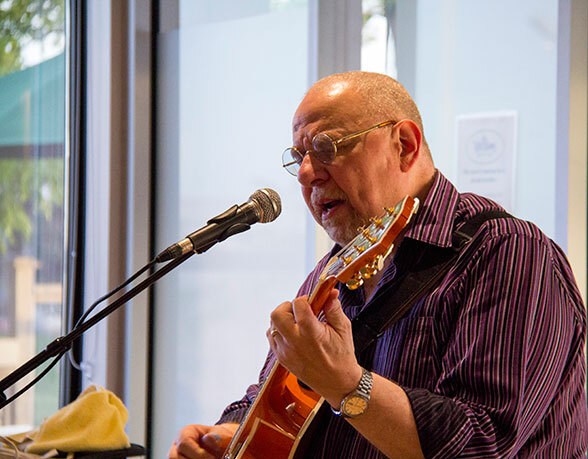 Robin Munro is the organizer extraordinaire of the Jazz and Blues Festival and with his “right hand ma’am” Sharon Winchester they have garnered together a stellar group of sponsors, partners, and media supports, of which Simcoe Dining is one. With such vast community support you are assured stellar performances; from the crème de la crème of jazz and blues musicians, the up and coming new talents and the charming recital students, new to their craft, each will delight the audience. I have heard more music in the last ten days then I thought was humanly possible and I loved every minute! From the Out to Lunch jazz concerts at the rotunda in Barrie City Hall with the aforementioned Yamaha piano, glossy in its instrumental glory, to the Heritage Park Concert Series, and a multitude of venues in-between. I saddled up at bars, sipped coffees, and danced on the grass under a magnificent moon. If there was music to hear, there was a crowd of music lovers eager to share the scene. This festival creates community within our community, bringing together a wide range of musical styles in a broad assortment of venues. 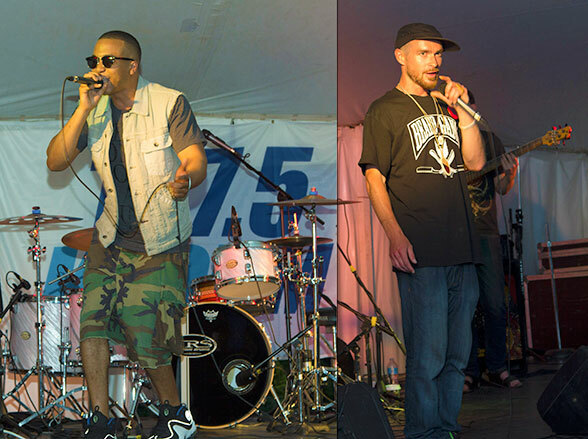 Hip Hop at the Urban Village, the cultural richness of The First Peoples Concert, heartbreak Blues, classic Jazz or the Sunday Morning Big Tent Revival Meeting, we had it all. I was blown away by Tia Brazda; when she played at Manhattans, her stunning vocals literally stopped traffic, I mean that. I saw drivers that simply had to brake and listen to Tia sing, regardless of the stoplight colour. 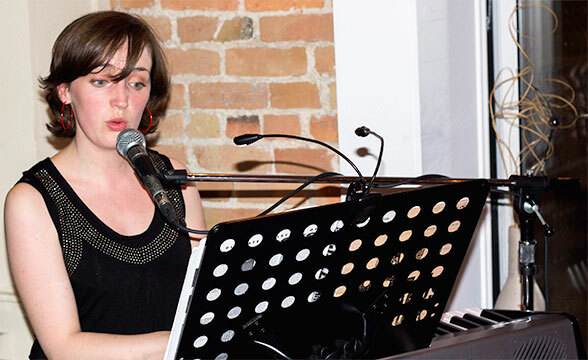 Listeners of CBC Radio 1 and Jazz FM91 will be familiar with her release “Cabin Fever”. I suggest you take note; she is a star that will shine bright. Hard at work in studio on her next release titled “Hard Luck”, Tia Brazda doesn’t need luck, this lady has talent and I suspect it will take her far. Shane Dennis, AKA “L.S.”; Barrie knows this man, married to the Unity Market, weekend warrior for year round Sunday community clean ups, he who camps out in the winter to raise much needed funds for those in need. I refer to Shane as “altruism personified”. He is a humble activist who works tirelessly to make the world a better place. Shane also sings, and he sings very well. As host to the Urban Village Concert he had the crowd on their feet in obvious adoration and admiration. Impressive. 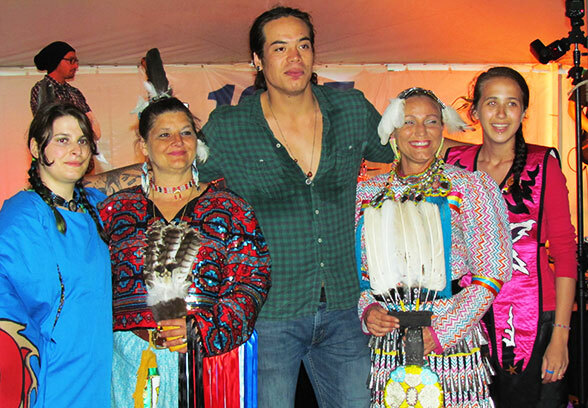 The First Peoples Concert Series; rich rhythmic drumming and dancing, the poise and grace of the Jingle Dancers, Logan Staats on stage from Brantford, and then the rocking performance by Marc Nadjiwan. This man has presence; his talent, his heritage, his father is Finnish his mother Ojibway and his height, he commands the stage. Tight with the guys in his band, they appear to enjoy making music and as such we feel it, we enjoy listening. Conversation with Marc was enlightening; he will be playing the 2015 Pan Am Games in Toronto. I hope to be there. Ditto Jack de Keyzer. He is the crème de la crème. Billed as the Festival Finale Concert, “A Great Moments in the Blues” concert, it was a recreation of Buddy Guy’s “Left my Blues in San Francisco” and it was amazing. 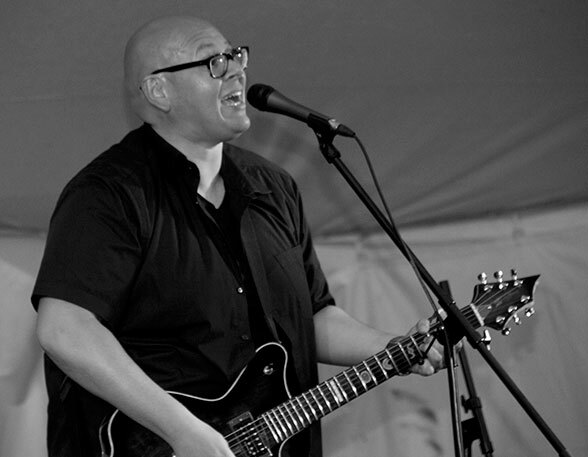 The tent flaps were blowing, the hands were clapping, and encores were called for, classics were played, including a personal favourite, Mustang Sally. 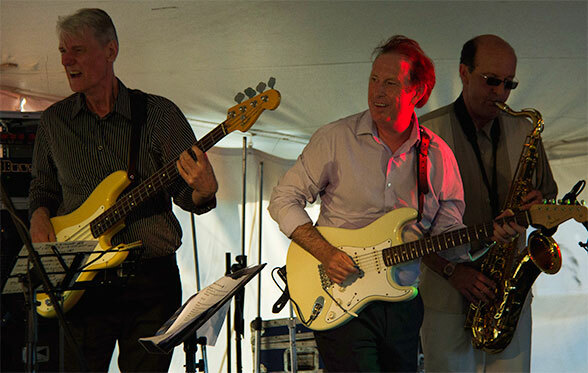 The crowd rose in unison to bop and jive as Jack de Keyzer jumped stage and roamed the length of the Heritage tent, delighting us with his guitar mastery, bringing it right down to us, we felt his music, every note. This is why the man has won Juno awards. An observation; I thought the established clubs and restaurants could create more promotional buzz for the jazz and blues performers playing in their venues. A few of the musicians mentioned this to me also, with talent of this caliber they should be playing to packed houses. 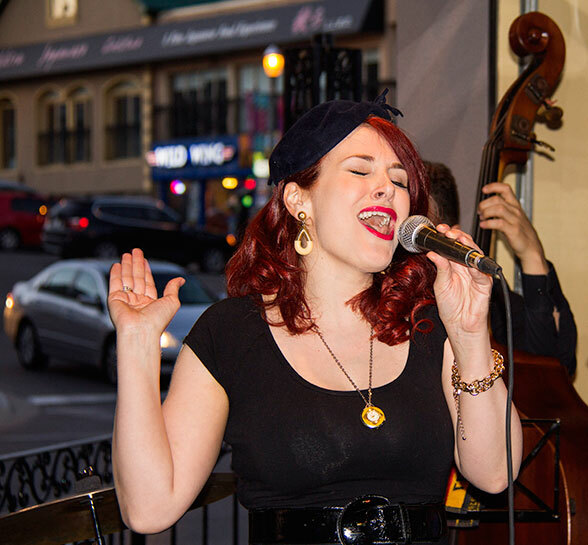 It would be great if there were links on the Barrie Jazz and Blues Festival website to the restaurants and clubs websites and have them updated daily. It was great to see social media presence, but more of the restaurants could participate. I commend Robin Munro for bringing us this festival; it is a labour of love that enriches our community.